MMBG George was our original herd sire. His pedigree is 100% Australian Breeding Management. 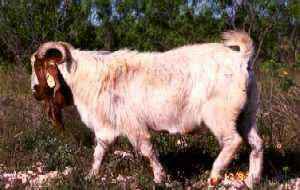 He was originally brought to the US from Australia as an embryo in a nitrogen tank by Rocky Comfort Goat Research in Rocky Comfort, MO. He was born March 31, 1993, and we purchased him on April 27, 1996. During the year and a half we owned him he sired 125 kids. 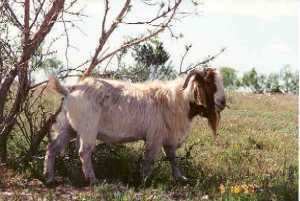 As of May 1999 we still had 40 of his offspring in our herd. 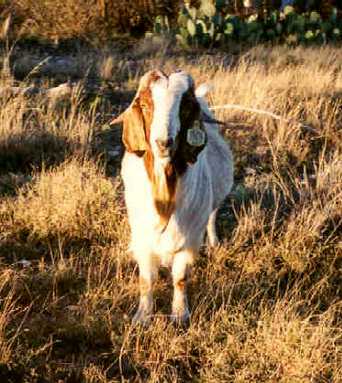 He was our herd sire until October 28, 1997 when we traded him to Antelope Creek Ranch. In the spring of 1998 he won his class at the Houston Livestock Show. George died in the summer of 1998 after being leased to another rancher. The rancher needed to move the herd to another pasture, so he cut off the water supply in the pasture George and his herd were in so they would move to the new pasture. Unfortunately nobody noticed that George wasn't with the herd when they moved, and he was locked in the pasture with no water for a week during the summer. By the time someone noticed he was missing, he was too dehydrated to save and died. We will always remember the way this gentle and tame buck could be fed pecan leaves and mesquite beans by hand. Rest in peace George.